Over the past four years I’ve seen an awful lot of cemeteries and memorials while the world remembers a generation decimated by the First World War. I’ve walked among flower-fringed headstones and plain memorial crosses, and I’ve visited memorials and museums across northern France that have all touched my heart in their own way. But there is something intensely poignant about the white cross in this simple village churchyard in the French Ardennes. 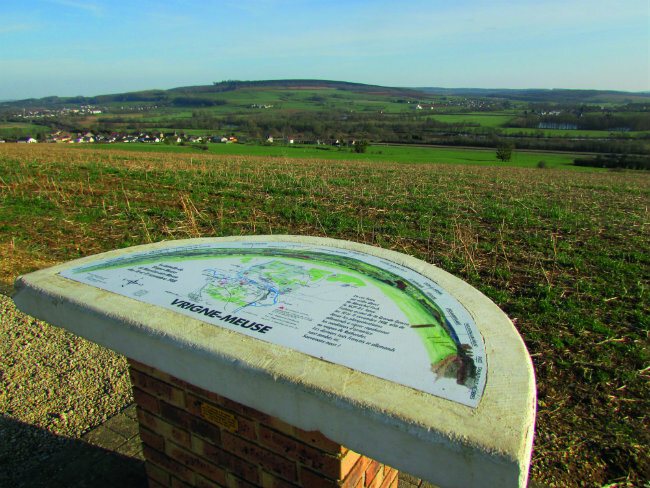 Here in Vrigne-Meuse, a small village near the departmental capital of Charleville-Mézières, lies the body of Augustin Trébuchon, the last French infantry soldier – or poilu – to die in the Great War. On November 10 and 11, 1918, the 163rd Infantry Division attacked across the Meuse on the orders of Marshal Foch in what was later described as “a useless battle”. The Germans were in retreat but still doggedly defending their positions, even as their generals were signing the Armistice conditions in Rethondes. Somebody always had to be the last casualty, but it seems a cruel turn of fate that Augustin Trébuchon died just ten minutes before his friend Octave Delaluque announced the ceasefire on his bugle. And what makes it worse still is that Trébuchon was simply carrying a message to the front line when he was felled by a bullet. 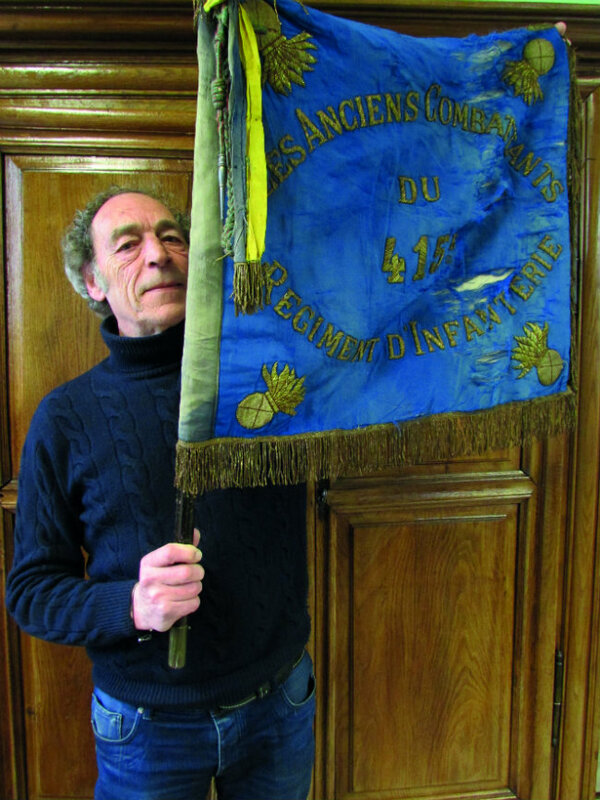 Trébuchon’s story has only emerged in recent years, thanks to research by local enthusiasts into the last battle fought on their now peaceful doorstep. 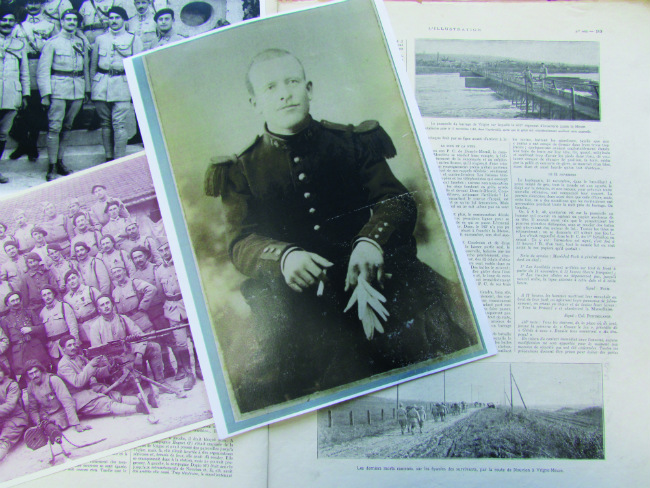 Suddenly Augustin became something of a local hero, a tangible link with the past for school children studying the Great War. 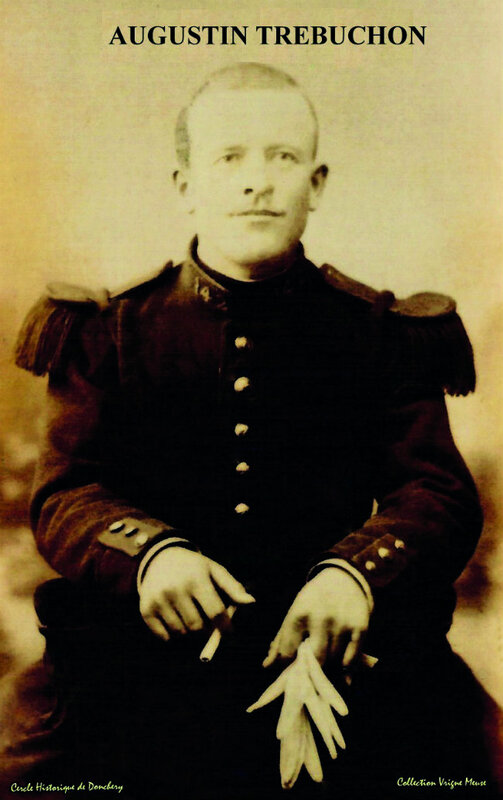 But this year on Armistice Day, this ordinary Frenchman who led an otherwise normal life will achieve national recognition as a symbol of pride in a lost generation. 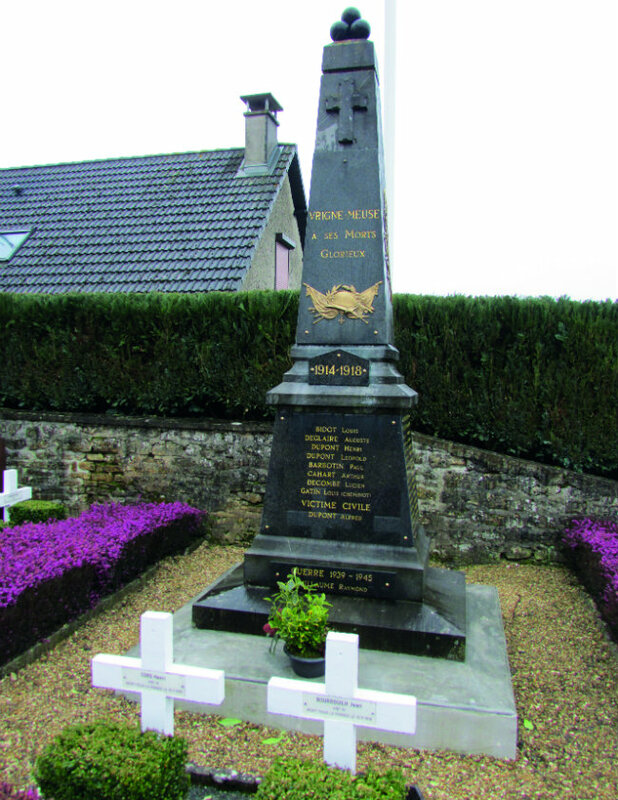 On November 11, Vrigne-Meuse will stage a ceremonial parade to bring high-profile guests from both France and Germany to this quiet village of just 300 inhabitants. Wreaths will be laid, military honours presented and tributes given. But the soldiers this time will be friendly, the atmosphere one of reconciliation rather than war. So, as Vrigne-Meuse prepared for its big Remembrance Day, I was curious to walk in the bootsteps of Augustin Trébuchon. There is no equivalent site in Britain to the tiny war cemetery tucked into a corner of this village churchyard. The last British soldier to die in the war, George Edwin Ellison, rests at Mons in Belgium, not on his home soil. One of six siblings, with two older brothers and three younger sisters, Augustin was born in the rural département of Lozère on May 30, 1878, the son of a shepherd. Augustin’s father died when he was just eight; his mother six years later, after which the children were brought up by an aunt. At the age of 12, Augustin left school and became a shepherd. Beyond that, we know nothing until August 1914 when, at the age of 36, he enlisted in the French army. Trébuchon fought in the Marne, at Verdun, Artois and the Somme. Wounded twice, he received citations for his calm and exemplary attitude. Then on November 8, 1918, he was posted to Ardennes along with 700 men from the 415th Infantry Regiment of the 163rd Division. His job: Agent de Liaison. The ceasefire was scheduled for the 11th hour of the 11th month, and with less than 15 minutes to the end of hostilities, Trébuchon was sent to the front line with his message. It did not contain military orders but the welcome news that the mobile canteen would open at 11.30. The fighting would be over and soup would be served. But Trébuchon’s war was to end ten minutes early when he took a sniper’s bullet. “We don’t know the exact circumstances of his death, but we do have an account written in the early 1980s by a local man,” says Chanot as we walk through the quiet streets to the spot where Trébuchon’s simple white cross looks out across fields towards the Meuse. The tiny war cemetery is flanked by box bushes, purple heather and ‘fence posts’ made from replica shells. But something doesn’t quite stack up. 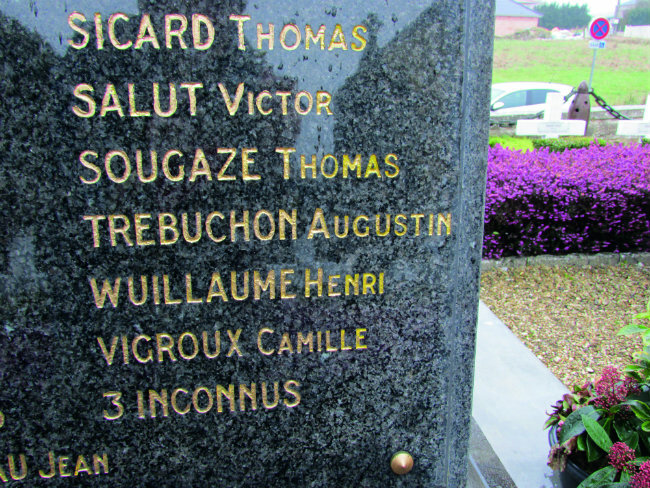 According to the simple inscription on the cross, Trébuchon and his comrades all died on Sunday 10th, not Monday 11th. The reason could be either political or practical. “It wasn’t good propaganda to admit that so many soldiers died on the last morning of the war,” says Chanot. “So some people believe that the date was changed to avoid political scandal. Others think it was done to make sure that families received war pensions for loved ones lost during the fighting. “Thirty-seven soldiers from the 415th Infantry Regiment died here that day. The bodies were gathered up from the woods and farmland that afternoon and the next day, and were taken to the church. Then, on the 13th, they were buried with full military honours. 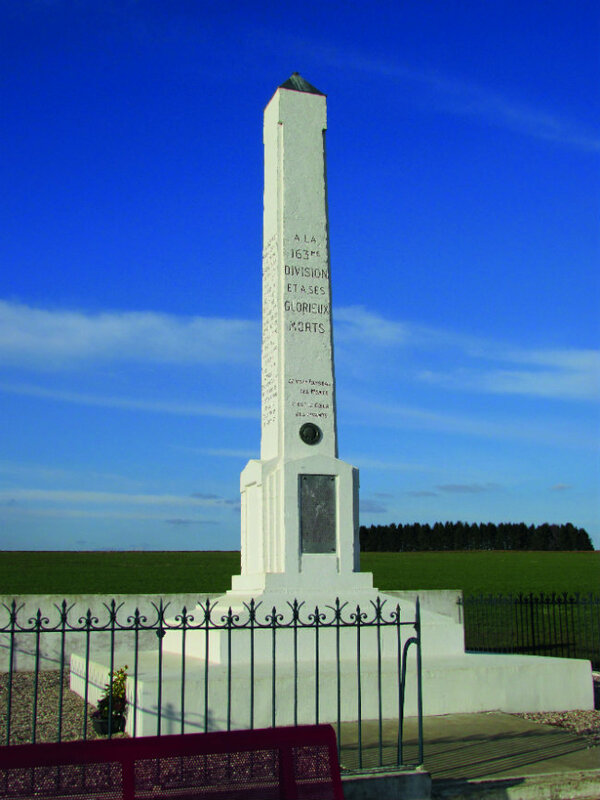 After the war, some of the bodies were moved by their families; their 18 comrades remain here.” Among many precious historical objects at the Mairie are black and white photos showing groups of soldiers, including bugler Delaluque, and four photographs of individuals who fell on the last day of the war, including Trébuchon. Chanot also shows me a copy of L’Illustration, a news magazine from 1920, which carries photos of the footbridge across the dam and stretcher-bearers taking bodies back to Vrigne-Meuse. One of them may well be Trébuchon. The men are gone but their deeds live on. 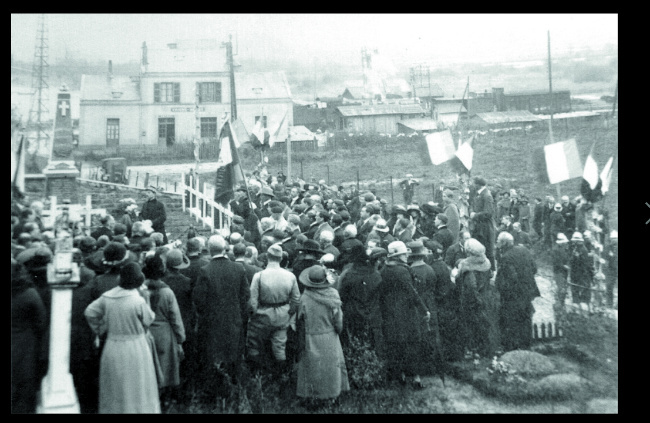 The main street has been named after the 415th Regiment, and on November 11, 2008, this quiet community also inaugurated rue Augustin Trébuchon. 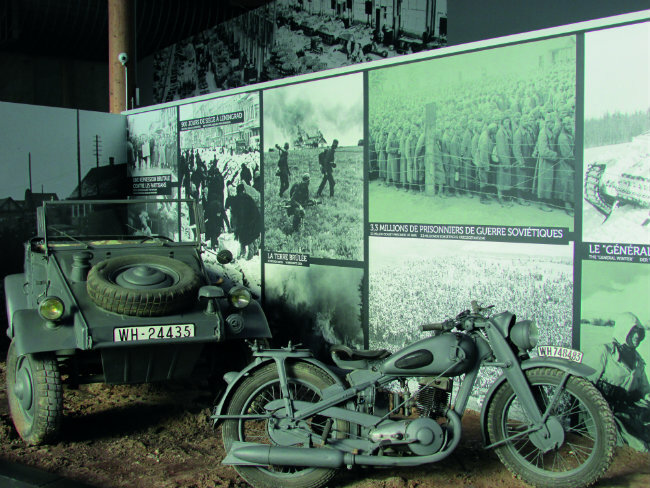 A 2km Trébuchon Trail was launched in April this year, ready for the centenary. The route begins at the entrance to the village in the newly-designed Esplanade, where a statue symbolising reconciliation and peace will be unveiled on October 14. The spirit of moving on is very important to an area that has suffered three periods of devastating loss of life: first in the Franco-Prussian War of 1870 and then in two World Wars. Below the monument, an orientation panel explains how the battle unfolded. And as I stand there in the spring sunshine, looking down over peaceful farmland and water meadows, it’s a strange feeling to think that this is where four years of human carnage finally came to an end. And that the very last man to die perished for a bowl of soup. BY BOAT: Gillian crossed the Channel from Dover to Calais with DFDS (www.dfds.co.uk). Prices start from £39 each way for a car with up to 9 people; premium lounge upgrade, £12 per person. BY ROAD: To reach Vrigne-Meuse, after Charleville-Mézières, leave the A34 motorway at Exit 6, then follow the D105 south. 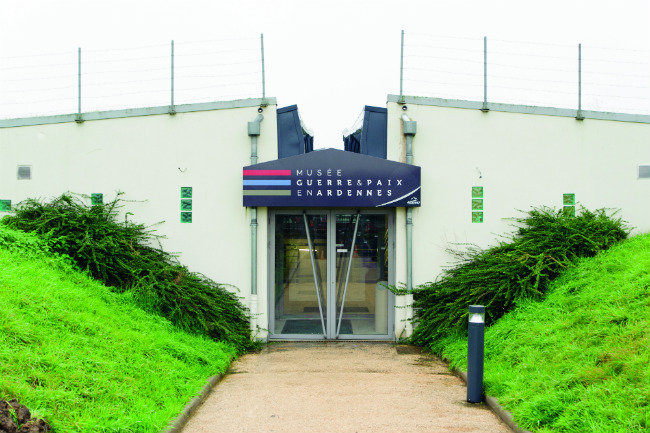 January 2018 saw the opening of the Musée Guerre et Paix at Novion-Porcien in Ardennes, housed in a brand-new building and featuring 150 uniforms, 50 machines and a huge collection of artefacts from the three major conflicts fought in Ardennes. 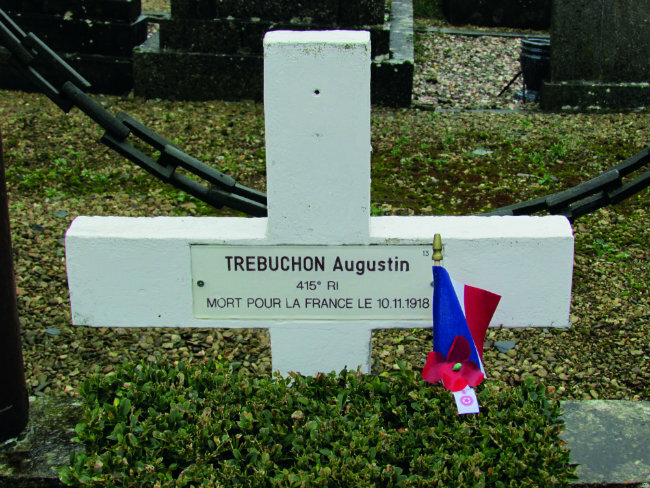 And, of course, the story of Augustin Trébuchon features prominently. Or something like it. In the style of a French comic book, or bande dessinée, a film has been created by writer Kris (Christophe Goret) and illustrator Maël (Martin Leclerc) that is inspired by the story of the shepherd from Lozère. A young soldier, called simply Augustin, dies from a bullet in the last minutes of the war while crossing the dam with his friend, Octave Delaluque. This much is based in fact. The rest, however, is fiction, designed to bring the past alive for a new generation, to emphasise the futility of war, and to show the effect that the Great War had on the women left behind. The story involves a romance, a baby, and three generations of Augustin’s family – though no record exists of Augustin Trébuchon getting married or having children. There’s hope for the future as the fictionalised great-granddaughter meets a young German whose great-grandfather… Well, I won’t spoil it. 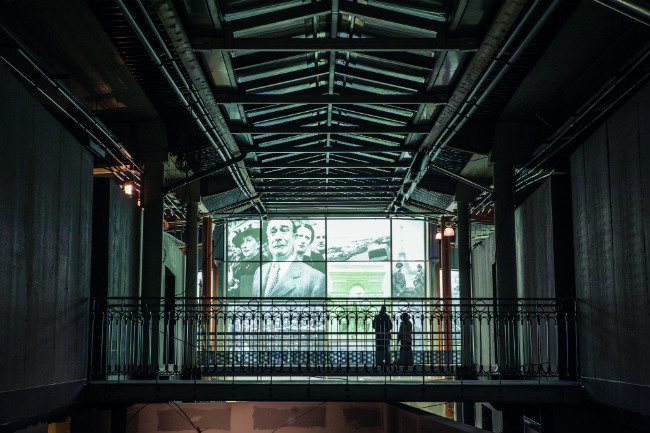 So while the story may not be true to Trébuchon, this clever short film is effective in making the Great War relevant to a modern audience, and fostering that all-important spirit of reconciliation that pervades Vrigne-Meuse. And I like to think that if Augustin could see it, he might be quietly pleased – a positive end to what he and his comrades gave their lives for. Sad but same time lovely to remember.